Happy Halloween! Would you get spooked being served a meal in a prison…with prisoners as your waiters? Well there’s just such a place — in Tuscany no less — and it has been voted one of the world’s scariest restaurants. 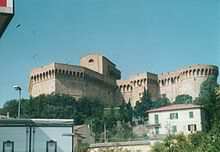 The restaurant is located in Fortezza Medicea, a medieval fortress in the town of Volterra. There are some pre-requisites if you want to dine there; diners must pass a background check and several checkpoints plus all cutlery is plastic. If vampires are more your thing, the town of Volterra is where the second Twilight movie was filmed. You can retrace the steps of Bella and Edward on a special walking tour. Prisoners and vampires, what more could you want this Halloween! Ready to travel to Italy? Perillo Tours has been leading group trips throughout Italy since 1945 and ItalyVacations.com can custom design an independent itinerary for your dream Italy vacation!